Sandwich shops have long been a popular option for people looking to grab a quick lunch or convenient meal, making them a vibrant and busy place to work. Yet alongside providing customers with great products and a welcoming atmosphere, sandwich shop owners also have other concerns that may seem tiresome but are still important for helping their business run smoothly. One of these is ensuring your business is fully protected against potential risks through a tailored insurance package, designed to meet your particular requirements. Public liability insurance can help with the financial expenses involved in defending against, and paying compensation for, claims from your customers that they have become injured or ill – or their property has been damaged – due to your business’s activities. It is important to make sure this cover includes work undertaken away from your sandwich shop if you regularly attend fairs or markets. As a business serving food and drink, you are vulnerable to claims from the public that your product has caused food poisoning or other illness or injury to your customers. Whether your customer blames your sandwiches for causing them to become ill, or claim they have scalded themselves on unmarked hot food or drink, product liability insurance can provide financial assistance to defend against and pay compensation for these claims. Note that you may be liable for these claims regardless of whether the fault lies with you or one of your suppliers. 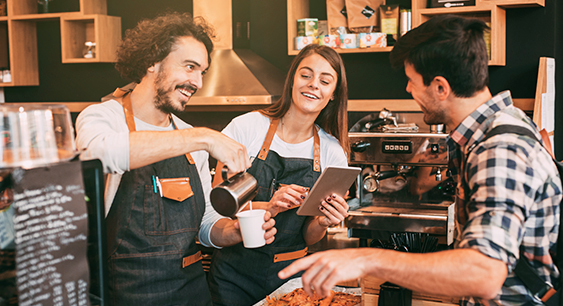 Employers’ liability insurance is a legal requirement if you employ staff at your sandwich shop – including chefs, waitresses and assistants. This applies to any workers employed on a temporary, casual or unpaid basis. Employers’ liability insurance can provide financial assistance if your employees claim to have been injured or suffered illness due to working with you. It is important to make sure this cover extends to when your employees are away from your business premises – such as making deliveries or representing your business at events. You may consider purchasing employee dishonesty insurance which can provide financial assistance if you lose revenue due to the fraudulent or dishonest acts of your employees. Buildings insurance can be useful if you own the building at which your sandwich shop is based. This cover can provide financial protection if your business premises is damaged due to fire, flood, strong weather or is the target of vandalism. If you rent your business premises, your landlord is likely to be responsible for buildings insurance – but check with them to make sure you’re covered. You can purchase tenants improvements insurance which can provide financial protection for any changes you make to the building and its fixtures and fittings – including window signs, awnings and kitchenware. Contents insurance can provide financial protection for the majority of items within your business premises that are not part of the permanent structure of the building. This includes shop furniture, tableware, cash registers, electronic equipment, kitchen appliances, tools and the personal possessions of yourself and your employees. You may wish to purchase separate business equipment insurance or equipment breakdown insurance, both of which can cover specified tools and equipment associated with your business. Equipment breakdown insurance is usually specific to equipment that needs repair or replacement following power surges, mechanical breakdown or operator error. Both these policies can provide financial assistance if you need to replace or repair kitchen tools, computers and phones, cash registers and refrigeration equipment. They can also cover any subsequent loss of income you experience during this time, damage to perishable goods and frozen stock, and cover for the recovery and reinstatement of data following computer malfunctions. Stock insurance can be a good option if you keep stock on your premises, including fresh produce. This cover can provide financial assistance if your stock is damaged, lost or stolen. Insurers typically include seasonal stock increase as standard, which compensates for the increased cost of stock during the busiest times of the year. Stock insurance is usually valued for the cost price of your stock, instead of the resale price. It is important to purchase high-level cover for your stock if you sell items of higher value, or deemed to be high-risk, such as alcohol. Whether you attend fairs and events your food and drink or you deliver prepared food to customers, you may benefit from goods in transit insurance. This policy can provide cover for items against damage or theft, and may include the price of your customers’ order. You may also consider vehicle insurance which can provide protection for the vehicles you use to transport your business goods, and covers the items within it against damage and theft. Cash on premises cover can be useful to protect your business money, whether you are transporting it to and from the bank or while it is placed in cash registers or safes – including at night. This cover can provide compensation if your money is lost or stolen, and often includes personal assault cover which can pay medical bills if you or an employee is assaulted during the theft of your business money. Business interruption insurance can provide financial assistance if you are unable to trade because of circumstances beyond your control, including unexpected strong weather and malicious damage. This cover can provide compensation for any loss of revenue you experience during this time and may include provisions for setting up your business in a temporary location. Loss of licence insurance: this cover can provide financial assistance if you lose your liquor licence, and typically only covers the income you usually receive through the sale of alcohol, dependant on the circumstances in which you lost your licence. Failure of electricity, gas and water offered as an extension to business interruption insurance, this cover can provide financial assistance if you are unable to operate because you have lost access to electricity, gas and water. Your insurer may also offer home contents coverage if your residence is on the same property as your sandwich shop.